Whether she’s playing the role of a princess or a knight in training, one thing is for sure, our girl Daniella Perkins always slays all day, every day. We seriously can’t put into words how much we adore the lovely Daniella Perkins. She is one brilliant, young lady whose vibrant and bubbly personality captivates us all instantaneously. We always enjoy watching the magnificent Daniella Perkins in the hit, Nickelodeon show, Knight Squad. Daniella Perkins shows her versatility as an actress by playing both the roles of Ciara and the princess in the show – meaning that a whole lot of excitement is always in store with her characters in each and every episode. Daniella Perkins has such a natural and effortless talent for acting. Seeing her wonderful, acting skills and her beautiful face on our TV screens is always a terrific treat. The fabulous Daniella Perkins has also exhibited her talent in other projects including in the Nickelodeon original movie, Blurt as well as shows such as Legendary Dudas, Girl Meets World, Nicky, Ricky, Dicky & Dawn and many others. With any and every project that she works on, we can see how much hard-work and passion Daniella Perkins puts in. In addition to being a marvelous actress, Daniella Perkins is also a fashion queen. She always looks dressed to impress and she wears some of the greatest #OOTDs. We wish we could be her BFF and go on daily shopping sprees with her. We love keeping updated with Daniella Perkins on all her social media networks. She shares some of the most incredible pictures on her Instagram account and she takes the best selfies. Girl, please teach us your ways! Needless to say, Daniella Perkins is a total gem and we can’t wait to see all of the other remarkable things she has in store to share with all of her fans. I, Alexisjoyvipaccess had the greatest honor of covering the 2018 Nickelodeon Kids’ Choice Sports and had an excellent time catching up with and interviewing the dazzling Daniella Perkins again at the event. Daniella Perkins dished exclusively to Alexisjoyvipaccess all about what she would like to see happen to her character in future episodes of Knight Squad, which athlete she would like to swap lives with for a day and so much more only in our VIPAccessEXCLUSIVE updated interview. Daniella Perkins even revealed who the MVP is in her life – hear what she had to say in our VIPAccessEXCLUSIVE updated interview below. Thanks for another awesome interview, Daniella! 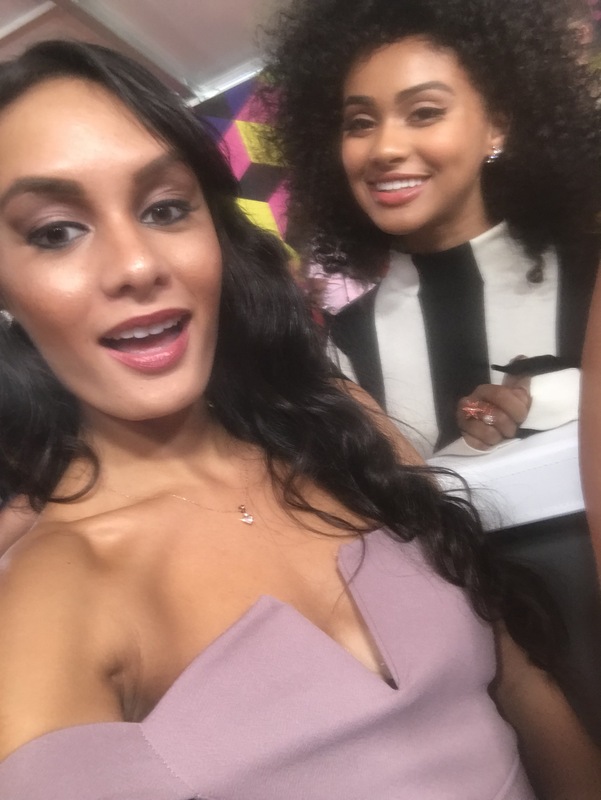 Check out my VIPAccessEXCLUSIVE updated interview with the gorgeous Daniella Perkins at the 2018 Nickelodeon Kids’ Choice Sports below! Be sure to tune in to the 2018 Kids’ Choice Sports airing tonight at 8:00 PM on Nickelodeon. Next VIPAccessEXCLUSIVE: “Double Dare” Host Marc Summers Interview With Alexisjoyvipaccess At The 2018 Nickelodeon Kids’ Choice Sports!